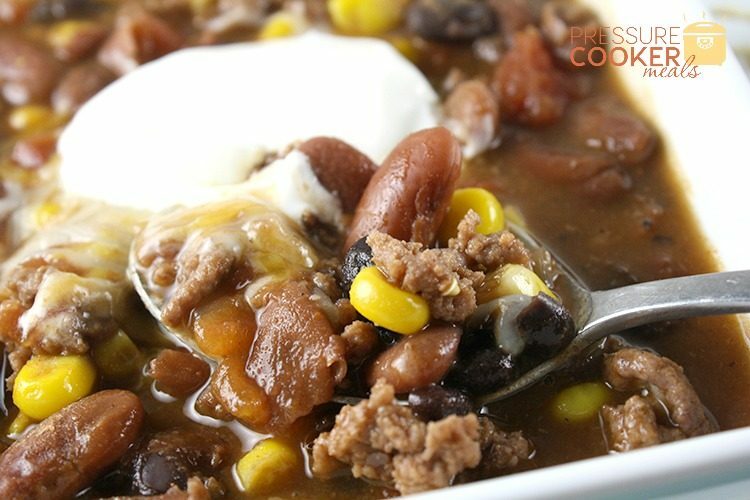 This Instant Pot Taco Soup is loaded with your favorite Mexican flavors, lots of texture and it’s very filling! It’s the perfect solution when you need an easy, delicious weeknight meal! 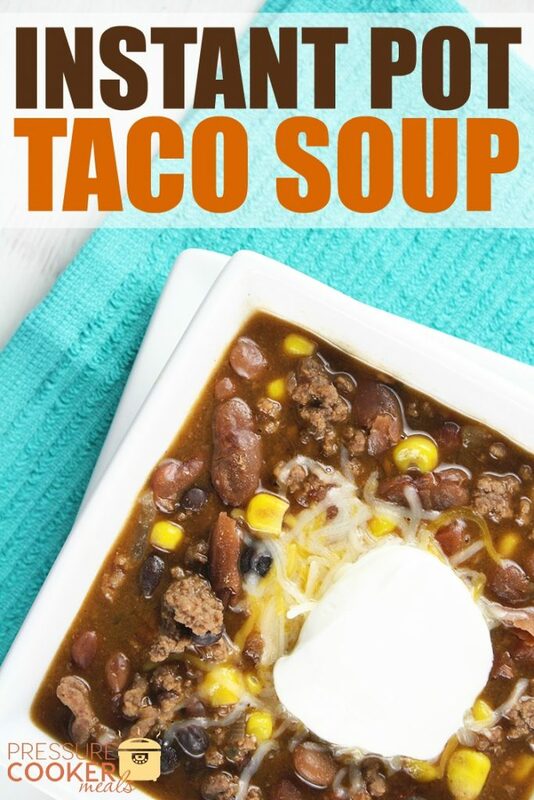 This is the exact same recipe that I use to make traditional Taco Soup – except I’m doing it in my Instant Pot, so it’s Instant Pot Taco Soup. I’m brilliant, right? If you’re interested, I have the traditional recipe over at Rose Bakes here. And if you like to give creative gifts, this makes an excellent inexpensive gift (a meal under $10). See how I make Taco Soup into a gift here on my personal blog. All that aside, keep scrolling to find the current recipe : Instant Pot Taco Soup! Anyway, with canned beans and frozen corn, this soup is incredibly easy to make and oh-so-delicious! Start by turning your pressure cooker on saute. When it’s hot, add the ground beef and chopped onion. Cook until the beef is browned and the onions are soft. Drain. Then add the ground beef and onions back to the pot, along with the corn, Rotel, beans, taco seasoning mix, ranch dressing mix and water. Press the “Soup” button, or use the “Manual” button and set the timer to 20 minutes. Once it beeps, do a “Quick Release” and your soup is ready to eat! 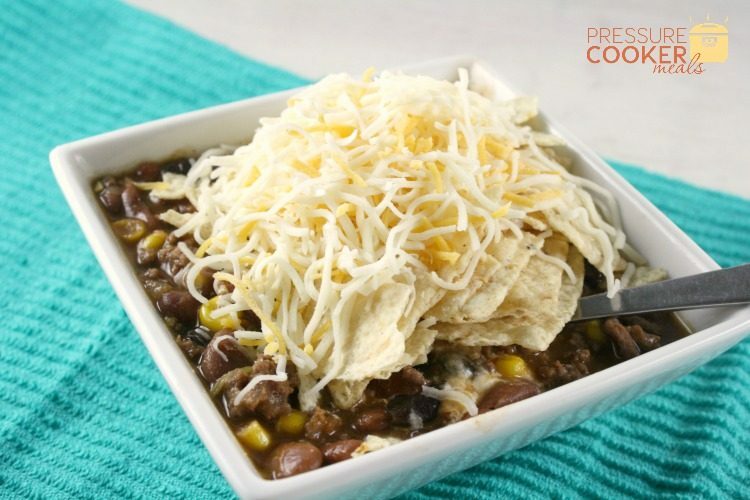 Serve with corn chips or tortilla chips, corn bread, shredded cheese, sour cream, and whatever else makes you happy! Our family is split.. we all eat our Instant Pot Taco Soup with tortilla chips, but half do sour cream and the other half only does shredded cheddar! And that’s it! It’s so, so easy! In the list of ingredients, I listed a few substitutions but I wanted to really highlight those here. You can use canned beans or you can prep beans ahead of time and use them from your freezer. You can also substitute whatever beans you have on hand or prefer. Use all the same kind of mixture like the recipe lists. I have used pinto beans, red beans, white beans, navy beans, and/or black beans depending on what I had on hand. I also often cook big pots of beans in my Instant Pot, let them cool, then dip them into freezer bags to have on hand for chili or taco soup. Frozen in 1 cup portions, they’re ready to go when needed. See how to cook Pinto Beans in your pressure cooker here. I do something similiar with ground beef. I’ll buy 3-4 pounds, cook it all at once, then portion it out and freeze it. When I do that, I can skip the first few steps of this recipe and just add the pre-cooked ground beef along with uncooked diced onion to the pot with all the other ingredients. Then I have supper ready in no time! Alrighty – that’s all I’ve got for ya! If you have questions, leave me a comment!